Men with symmetrical faces are less likely to lose their memory and intelligence in later life, according to researchers. Psychologists at the University of Edinburgh found a link between facial symmetry and mental performance between the ages of 79 and 83. The researchers analysed results of the 1932 Scottish Mental Survey and mapped the faces of subjects from photographs. They said it could show a link between physical condition and mental decline. Facial symmetry, the researchers argued, may indicate a man has experienced fewer genetic and environmental disturbances such as diseases, toxins, malnutrition or genetic mutations during his development. Dr Lars Penke, who led the study, said: "Previous research has suggested that cognitive decline is an aspect of body-wide ageing. 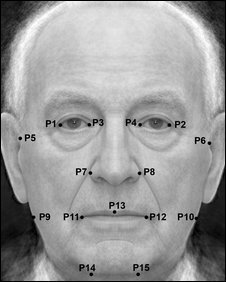 This link could show that facial symmetry can be used as a marker which could predict this decline." The team was unable to find comparable results in women. One explanation suggested by the researchers was that DNA has a different effect on ageing among women. Another theory was that mental decline is delayed in women because, on average, they live longer. The results of the study have been published in the journal Evolution and Human Behaviour.